Son of Godzilla is one of the strangest entries in the series. It is one of my least favorite movies in the series, but many people really enjoy it. It is very campy and very strange. So, if you watch Godzilla but find yourself thinking, “I like watching Godzilla wrecking cities, but I really want to see him abusing his young son”, so this film is right up your alley. A team of researchers begun conducting weather experiments on an island. As they are trying to do thier experiments they are attacked by giant mantises. In one of their experiments, they increase the temperature of the island. This temperature shift makes the mantises even bigger (yeah, I don’t know how that is supposed to work), and exposes a giant egg. This movie is intended for much younger audiences… I guess… I was really turned off by the constant abuse of the baby. It’s supposed to be comical, but for me it fell flat. But be that as it may, it does have a very touching ending. One of the most moving endings of all the Godzilla movies. Over the years, the Godzilla suits have had many changes. 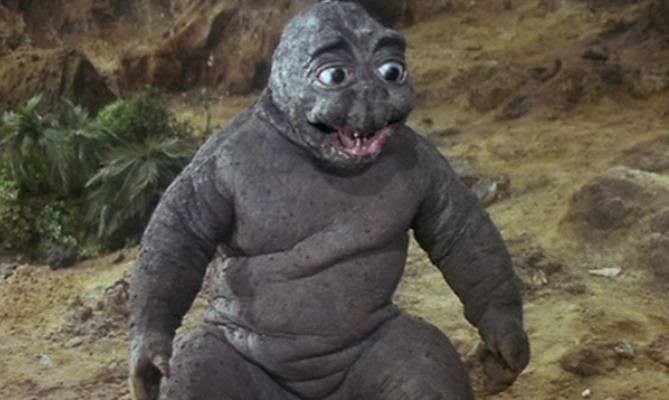 In this movie, they wanted to make Godzilla’s look more kid friendly, so his eyes are bigger, his snout is shorter, and his head is more human shaped. This look would continue for the remainder of this original series. Related: Godzilla Reviews: “Godzilla Raids Again,1955” or the Fight of the Monster Masters!